Is that a PWN dial? If so I hope it goes to 11 for maximum pwnage. Can’t wait to try this out tomorrow when I’m not so tired and hungry. Heard about this from CDM. Have given it a proper try and gotta say: Pretty dope! What would be really cool if it could output the midi as well. Care to port it to linux via LV2 or DSSI? Linux version is a mite tricky since neither of us have linux dev environments, nor spare hardware, nor spare time, and also a chunk of the code (that implements the xml skinnable ui) is my copyright, so I don’t want to release it. That we get both the internal sound engine and the ability to play other VSTi etc! Very cool device. Just hooked it up to my Korg PadKontrol and having a lot of fun with it! Really inspirational… It would be nice as an MIDI plugin too.. to chain into other VSTis / hardware. On the download now. Can’t wait to play with this badbwoy, the clips you posted are sounding awesome. i made a track i am quite pleased with just using harmony box, sooperlooper, and a few other effects. could i send a link of my track to you? it is a bit long so be warned! Put it up on SoundCloud! Then we can all click and hear it! Great sounding synth. Real nice interface. Many thanks for sharing. This will see much use :. Hi thanks for making such a good free synth. i really dig the sound of it. I am using the AU unit with Logic pro 7.2, upon launch the synth can be triggered by my controller keyboard, but once a sequence has been made or any navigation away from the synth, it loses connection and i am unable to trigger the sound from it. 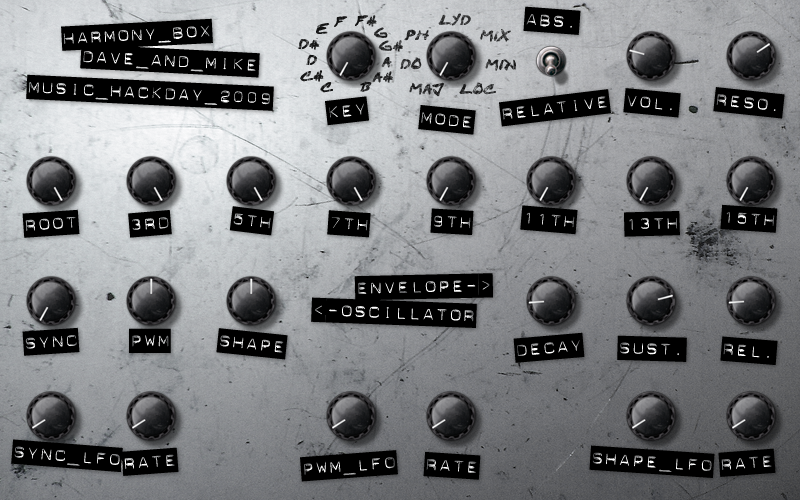 :s i hope this is a bug that will be fixed as it is an amazing sounding synth. wicked,been looking for something like this for years. keep it coming bro. very cool… i really like it. what exact chords is it playing? yo just check out your harmany box bro,yo don’t give up on it bro.the concept is fire,hot.finish it off. or should it play the whole time ? Hi, cool idea! Works fine (VST and AU) in Live 8.0.4 on Mac, 10.4.11, but with the occasional click at the beginning of notes even in Absolute mode. However, Logic 8 Express doesn’t like the AU at all. When instantiated and I play the first note is played, it’s like the sustain pedal is on continuously. To make it stop, I have to press Bypass in the Logic AU host window. Then, when I un-Bypass, can’t make Harmony Box make a single sound. +1 on a version with MIDI out! That would be übercool. If the resonance is set high enough, it’ll play continually, as the filter self-oscillates. Also, it doesn’t handle Note-On/Vel=0 as Note-Off, which some hosts implement. If I get time I’ll sling up a version that handles that. @bodan; it’s following the rules for chords in modal jazz. When you pick a key and a mode, you’re picking 7 notes that form a scale. When you play a note of the scale, it plays 1st, 3rd, 5th…,15th relative to that note, within the scale(key/mode) you’ve selected. The amount of each note gets dialled in with the knobs. thanks for your reply. i really like that plugin!!! great work. simple and so useful. i made a donation to proof my respect for your great work. Can you send me a crash log? When it crashes, click for more info, and copy and paste that. Send to dave@dmgsound.com plz!! i love this plugin,still a bit buggy but i love it. having problems with it in logic 8 and it would be great if you got the midi notes to the cords in the piano roll editor not just a line, so you can move the midi to diiffrent tracks to trigger diffrent sounds. p.s or it came with other sounds. Can’t get any sound out of it in Logic 8.03 on a Mac Pro 8 core, latest updates. Works on the iMac G5, but not the Mac Pro. Anything I can try? please come with an update. Very Nice…Will try to use in an upcoming production. I do alot of this kind of chordal stuff manually in step time..
would be even better if it output midi! Great, i was looking for something like this a long time. Unfortunately there are no presets and no option to generate other sounds. But i believe the next version will be better. very cool indeed. I like very much the sound engine actually. worrk nice as VST with Cubase 4 under OSX Tiger, except the black keys play single notes only, no chords. Only white keys play chords. Am i missing something? You are indeed missing something, but you’d only know it if you studied jazz theory. Nice sound on this, I wrote up a little sketch instantly. However, automation seems to be a bit wonky. I was automating the mode switch in Ableton and while assigning MIDI controls elsewhere, it kept stealing focus! It also doesn’t seem to put out an automation line there either. While automation works internally, it doesn’t seem to play well with a DAW. Cool plugin, couldn’t get it to work properly tho, i’m using Cubase LE, and when i press a key on my MIDI controller it triggers the synth but then when i release the note it doesn’t stop. I had a mess around with the envelopes but nothing changed it. +1 on Midi output please. Will investigate on Snow Leopard as soon as I can get a copy installed. Can you tell me what happens now on Snow Leopard? If it’s failing in AU Validator or somesuch, can you paste me the output? Thanks! Can’t get a single sound out of it.. It DOESN’T cause any crashes. Maybe this helps..
great plug, i like it very much. However: on energyXT 2.5 there’s no note off… I just saw that you are aware of this problem. It would be great if you (occasionally) would post an update… that would be very kind. However, thank you very much. Like it. Instant bliss. does not work, any suggestions? It would be especially cool of one could import .sf2s into Harmony Machine to be harmonized and filtered. Linux version would be vastly appreciated, if you are able to make such a thing. Got it off the Computer Music magazine DVD. Running Reaper. I added it as an FX to an audio guitar track. I see the GUI however it has no effect on the output sound no matter how much I twiddle the GUI???? I am a newb but all other effects I have installed to date work fine. I just downloaded this today. Can someone tell me how to make the notes shorter?